One of my favorite things in the Montessori classroom is the way they set out their art materials as though they are something to be treasured and displayed. The colored pencils are organized into matching colored holders (like these), and I’ve always wanted a set of my own (but not for $75!). Truth be told, my boys will use colored pencils and markers any day of the week, but crayons seem to always get passed over in favor of practically any other medium. Those poor, poor crayons needed some love and respect around here. 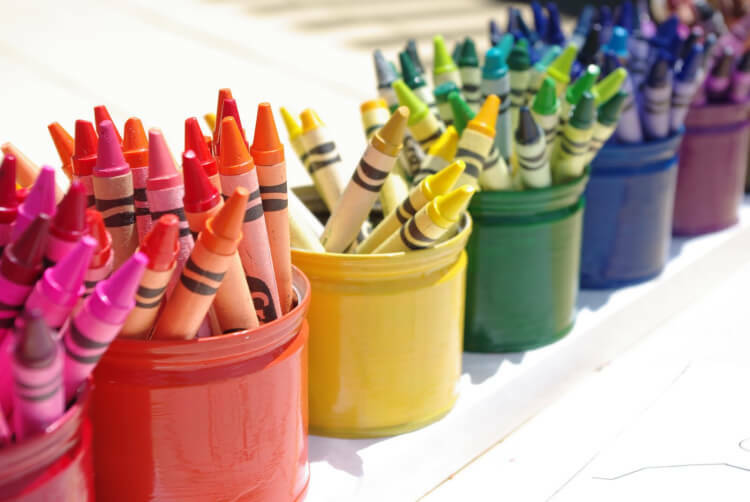 I thought that maybe if I set out the crayons in a pretty display that the boys would be more apt to use them on a regular basis – and I was right! While packing school lunches one evening, I realized that these fruit cups would be the perfect size for crayon holders. So, instead of being patient and waiting for a bunch of empty cups at the end of the week, I started opening and dumping seven containers of fruit into a big Tupperware for storage – hey, they can always be reportioned into little Tupperware containers for lunches – I’ve got to get moving on this inspiration! If you’re lucky enough to have a rainbow of spray paint, it would really come in handy right about now. I only had about half the rainbow, so after removing the labels, I used acrylic paint to give each can three coats of paint followed by two coats of glossy varnish to seal it. Mitch rummaged up a piece of scrap 1×3 for me, and I made use of my white spray paint to give it a quick coat. Mitch screwed each can to the piece of wood for me (thank you! ), because I’m not quite as handy with the drill as he is. Now it’s time to add the crayons! I forgot to add with my comment how I liked the way you used colors in the same family in each container. This is an excellent idea for children who are learning about colors as each primary color has various hues. Love this! I, too, am looking for ways for the crayons to get used! Our art teacher has a set of the swiss miss coffee containers. I like the fruit cup idea and it would be affordable to just do it the quick way you did.